rec. 26-28 January 2005, Oratorio di S. Erasmo di Sori, Genoa. I have had a great deal of pleasure � and, indeed, pleasurable instruction � from many of the CDs issued by the Italian label Tactus. But, sadly, I have to report my disappointment as far as this particular CD is concerned. Caldara�s reputation has not, in modern times, regained quite the lustre it had during his lifetime and for a long while after. Both Bach and Telemann studied and admired his music; Haydn, Mozart and Beethoven were all familiar with his work. Charles Burney praised Caldara as the composer of choral works which were �grand and majestic in ... public performance, and curious and improving to the student, in his private studies�, calling him �one of the greatest professors both for the Church and stage that Italy can boast� (A General History of Music, 1776-9). The English composer Charles Avison put him in very good company in his Essay on Musical Expression (3rd edition, 1775), praising �the bold and inventive SCARLATTI; the sublime CALDARA; the graceful and spirited RAMEAU�. There isn�t, I�m afraid much that is either majestic or sublime to be heard in these performances. The orchestral playing is adequate, though not without blemishes; the choral singing is somewhat ponderous, with one or two problems of intonation. None of the soloists are, it has to be said, particularly distinguished. Nor is the recorded acoustic entirely helpful, with patches of muffled sound and odd inconsistencies of placement and distance. These are the sort of performances which, were one to meet them at a concert in an Italian church would be a pleasant enough experience; there are things to enjoy, in parts of the mass, for example, and in one or two of the motets; but the performance as a whole isn�t successful enough for one to want to return to it repeatedly on CD. A shame, because Caldara is, indeed, an interesting composer. The earliest works here, the sacred motets, were written in Rome; the collection, published in Bologna by G.A. Silvani was the only sacred music published during Caldara�s lifetime. They contain a good deal of inventive music, of flowing polyphony and � sometimes � almost dancing rhythms. The ways in which Caldara responds to his texts are often quite striking. But they need and deserve more consistently successful performances than they get here. And it would be good to hear the whole set of twelve. The Missa Dolorosa is not one of Caldara�s greatest works � written as part of his enormous output at the imperial Court in Vienna � though the case for it might have been put more powerfully than it is here. The Sinfonia which opens the disc also belongs to Caldara�s years in Vienna. The booklet notes are very brief and not especially helpful; the texts are untranslated. In short, though there are things to enjoy here, this is not a CD which matches the high standards which Tactus has set in it best recordings. 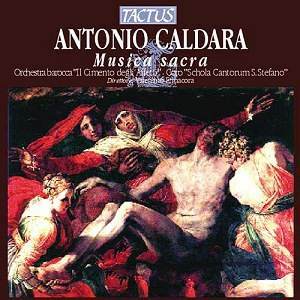 For Caldara at something like his best and performed with greater assurance and technique, one needs to go to recordings such as Ren� Jacobs� marvellous version of Maddalena ai piedi di Cristo on Harmonia Mundi or, for the instrumental music, the trio sonatas played by Parnassi musici on CPO.